CBC Docs POV | TV, eh? I’m a cat person, and I’ve noticed a dearth of programs devoted to the celebration of our feline friends on television and film. There are copious hours devoted to canines via Best in Show, the Puppy Bowl and—of course—the Westminster Kennel Club Dog Show. Heck, there have been documentaries screened at Hot Docs spotlighting donkeys and chickens. But nary a moment really spent on cats aside from the excellent episode of The Nature of Things, “The Lion in Your Living Room,” which was more about the science of cats than the animals and those who love them. Cats and their owners are celebrated to great—and often comic—effect in “Catwalk: Tales from the Cat Show Circuit.” Broadcast on Sunday at 9 p.m. as part of CBC Docs POV, the hour-long episode from the folks at Markham Street Films (Celtic Soul, Fight for Justice: David & Me) is a riot of fur and the colourful characters who lug their cats around Canada to determine which is “Best Cat.” It’s a cutthroat business in the Canadian Cat Association, as evidenced by Kim Langille who sums it up thusly: “If you’re not No. 1, you’re the first loser.” Wow. Over 12 years ago Kim was bitten by the competitive bug when she adopted Clancy and he became champion. Now she hopes to do the same with Bobby, her white Turkish Angora. Standing in Kim and Bobby’s path to fame are Shirley McCollow and Oh La La, a fluffy Red Persian who made a splash at the Canadian National Exhibition. The claws are out and the fur flies as … OK, not really. There are no literal catfights in “Catwalk,” but there is plenty of side-eye and glimpses into the truly, um, unique, world of the Canadian Cat Association. 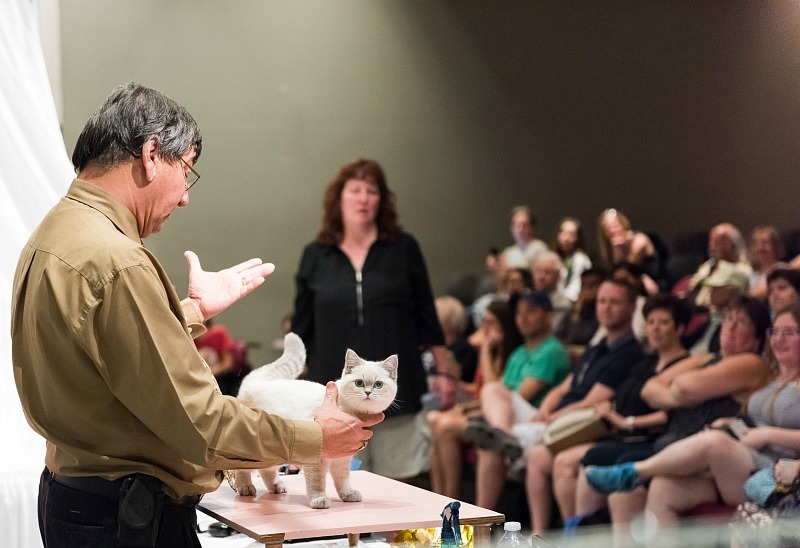 After an introduction as to how cat competitions work from Kim, Bob and Elaine Gleason—a husband and wife cat show judging team—detail how purebred felines are led through multiple rings where each is judged on whether they tick the boxes of what a purebred should look like. As the season rolls on, it appears to be a two cat race between Oh La La and Bobby until some young upstarts begin clawing their way into the standings. Who will take home the title of “Best Cat”? Tune in to the highly entertaining “Catwalk: Tales from the Cat Show Circuit” for the final showdown. “Catwalk: Tales from the Cat Show Circuit” airs Sunday at 9 p.m. as part of CBC Docs POV. Images courtesy of Markham Street Films.